One click tweet to recommend Jack Who? Jack was turning her on, simply by standing, more than Kel had affected her in the midst of so much more. Because of that, an override was occurring, her words and actions governed by libido and impulses instead of logic and instinct. He remained silent, assessing her next sip as closely as she had done his. Relaxing into the sweet spell that seemed to settle around them, she whispered, “So, the best cure for stage fright...is this?” She tilted the bottle for an extra sensuous sip. Dark eyes welded with hers conveying instinctive and primal understanding, male to female. “Well, maybe not the best-best...” His voice deepened a few decibels, and the husky whisper was possibly the most sensual sound ever to reach her ears. “What’s the best?” Her inquiry rode more on a breath than a whisper. With her fiancé, she had made the first move hundreds of times and with college hook ups a few times when extremely inebriated. Now, despite this guy being a stranger and her being relatively sober, she tailed her fingers down bare skin, from the art just above the first row of pecks, to the still open fly. Struggling for a casualness she couldn’t feel, she tipped the bottle for another sip and wanted so much more than that swallow. Not for a favor, or because he was famous. Simply because an intimate connection with him became something she needed– even if it only came down to her knees on the cool tiles of the floor. Jack had more in mind. His bottle clinked as, reaching behind her, he deposited it on the granite counter top. Next, he used one long tan finger to hook a strand of her hair, pulling it over her shoulder. Automatically, her body leaned into his as he closed the two steps between their toes. Her heart pounded hard, racing with the knowledge that she might be kissed by him...this man that awakened lusts of a nature that she had never felt in her twenty-two years. The anticipation when his head dipped sent the blood roaring through her veins. His lips angled against hers, testing with a frictional brush, then his tongue was swiping in a way that stole her breath. After a teasing pull with his teeth, he deepened the kiss, and her tongue eagerly mingled with his. There was not a way to pinpoint what was different about this kiss from any other she had ever had, but it was incomparable. Hot and sweet, it kept her hoping that it would never stop. 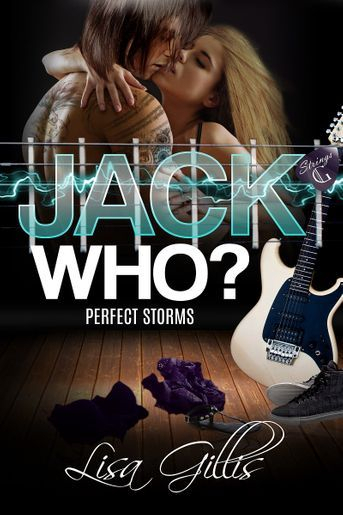 Have you liked Jack Who on Facebook?